BÌNH ĐỊNH— More than 16,300 artifacts believed to date to 14th century have been unearthed in the central province of Bình Định at the former site of Vijaya, the political and cultural hub of the Champa kingdom. 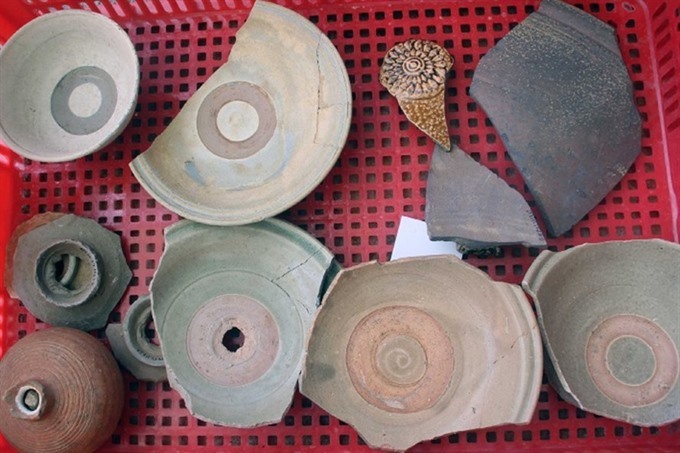 The ceramic and porcelain items were discovered recently at a 200 sq.m site in the Đại Bình Village’s Cây Me in Nhơn Mỹ Commune of An Nhơn Town. Excavation work began in October. The artefacts, including bowls, plates and jars, of the Champa culture were from the late 14th and early 15th centuries when Vijaya was still a county of the Champa kingdom, experts said. The most impressive artifacts were found in eight kilns, which may have dated to the 15th century, researchers said. About 25 porcelain objects produced by the Chinese were also found. They expect to find even more items that could shed light on Bình Định’s history and culture. “The discovery of pottery kilns 800 years old in Cây Me contributes evidence to confirm the long tradition of pottery making of the Champa,” said Dr. Lại Văn Tới, deputy director of the CICR. Tới said that local authorities should protect the site for further research.